Sometimes, you need to step back to move forward. It may seem counter intuitive, but entrepreneurs are often running so fast that they can miss huge opportunities or go miles before they realize they’ve been speeding in the wrong direction. Throughout the year, our team will host multi-day gatherings of entrepreneurs from diverse backgrounds at The Retreat. These sessions are part executive education, part rejuvenation and all about building a network of like-minded people who will provide insight, support and guidance well after the session ends. We call this the “Entrepreneur Bootcamp” but consider it an opportunity to step away from your business for a brief time so that you return recharged and ready to scale new heights personally and professionally. align5 is thrilled to host the 3rd Annual CEO Boot Camp in the Florida Keys during Super Bowl weekend. 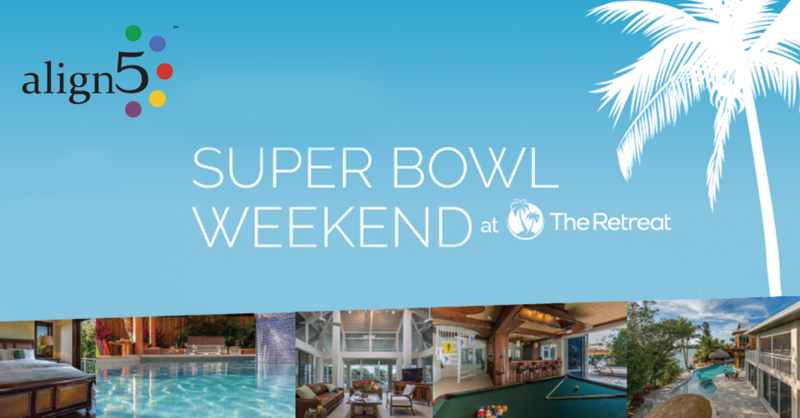 Come network with a unique group of entrepreneurs from a variety of backgrounds and enjoy all the amenities of a luxurious private resort, while taking in all of the festivities leading up to the NFL championship. DON’T WAIT – RESERVE YOUR SPOT TODAY! Call Denise Richmond at (610) 299-6466 or email her at drichmond@localhost. -Shawn Scarlata, CEO and Founder of SMART Security Pros. Entrepreneurs need a place to relax, recharge and make connections that can drive their future success. No one knows this better than John Ratliff, a serial entrepreneur who is the owner of The Retreat and a co-founder of align5, a consultancy focused on helping entrepreneurs achieve their goals. John has designed The Retreat to be an exclusive, luxurious, island getaway in the Florida Keys, where people of diverse backgrounds and interests come together to share ideas, exercise creativity and draw inspiration from the energy of like-minded individuals. To learn more about The Retreat, please visit marathonretreat.com. To learn more about John and align5, please visit align5.com. If you are interested in more one-on-one time with Verne in a small group of 10 instead of the thousands that attend his conferences (like the upcoming Fortune ScaleUp Summit), you’re invited to attend his second CEO Boot Camp March 7 – 10 at The Retreat, in Marathon, Florida, located two hours south of Miami in the Keys. The first CEO Boot Camp scored 9.8 out of 10 (five led businesses over $80 million; five under). Thank you so much for this experience. I have come back feeling excited and empowered with a clear game plan for 2017. Working one on one with you (Verne) was a highlight as were John’s (Ratliff) stories. The content was presented in such a way that it really became actionable. This is a chance to connect with Verne’s broad network, contacts, and experience to help solve the constraints in your business – along with having the opportunity to spend several days together with nine other CEOs. Currently several of the spots are already reserved. After 8pm – In and around the hot tub where the real problems are solved! The Boot Camp is $7500, which is all-inclusive of food and accommodations. Attendees may depart Friday afternoon or stay the weekend to further decompress for no additional charge. It was the best education experience I’ve ever had. – Tom Bemiller, CEO The Aureus Group. For more information or to reserve your spot, contact Tanya Fraser at tfraser@gazelles.com. If you are unable to make our next event, don't worry! We host events throughout the year. Sign up to receive updates on all of our future events.